PARIS - Three French schoolchildren were hurt in the attack near London's parliament on Wednesday, French officials said. The three were students aged around 15 or 16 of the Concarneau Lycee in Brittany, western France, according to a report in Le Telegramme regional newspaper. Prime Minister Bernard Cazeneuve confirmed on Twitter that the three were schoolchildren. 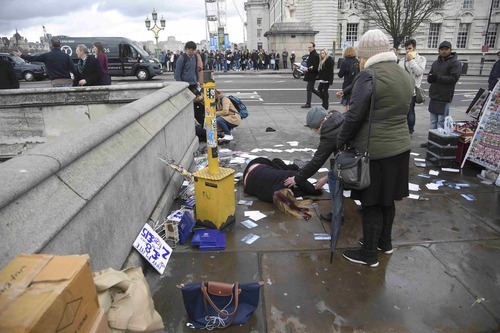 The report in Le Telegramme cited a fellow students who was at the scene of what British police have described as a terrorist incident, saying the three were hit by a car that was involved whilst walking on Westminister Bridge. Witness describes seeing a car hit people outside British parliament. 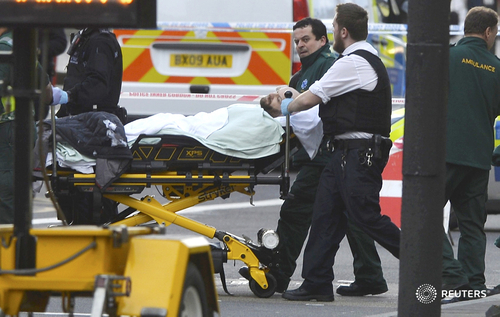 Three French upper school students injured in London attack - French media. A witness describes feeling 'sickened' by what he saw outside parliament. An assailant stabbed a policeman and was shot by police just outside Britain's parliament building in London on Wednesday in what police described as a "terrorist incident". 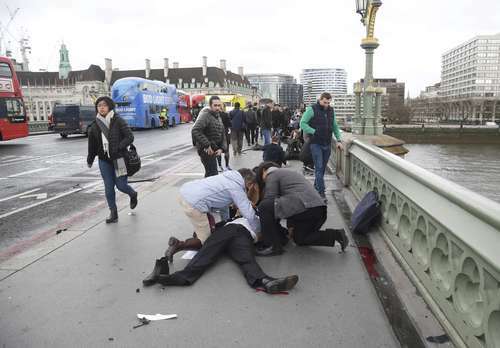 London ambulance service says it has treated at least 10 patients on Westminster Bridge. MORE: British police say additional officers, armed and unarmed deployed across London. BREAKING: British police say number of casualties, including police in attack near parliament. 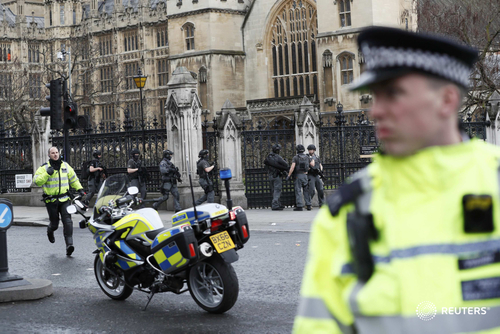 British police request public to avoid area around parliament and nearby bridges. UPDATE: Sky News reports two people dead in London attack. Sterling recovered and government bond futures fell back on Wednesday, after an assailant was shot outside the UK parliament by police, loud bangs were heard and a Reuters photographer saw at least a dozen injured people. British police said they were treating the incident as a terrorist incident until they knew otherwise. Scottish parliament says to increase security with immediate effect after London attack, says no intelligence to suggest specific threat to Scotland. UPDATE: U.S State Department says closely following 'concerning situation' out of UK parliament. 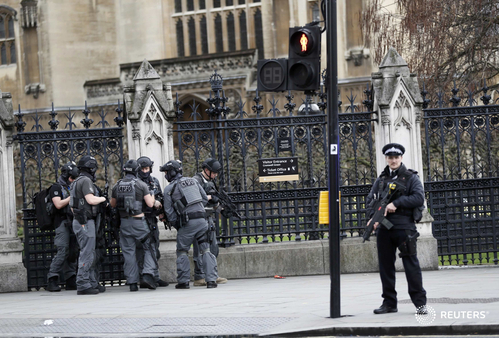 British police say they are treating situation near parliament as a terrorist incident until known otherwise. 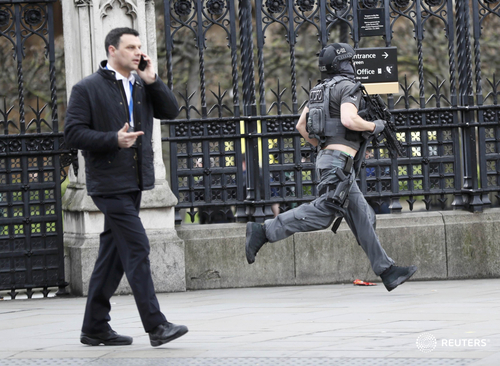 British security source says motivation of attack outside parliament still unclear. President Trump says he just got an update on the situation in London. Video from the scene outside British parliament just moments ago. 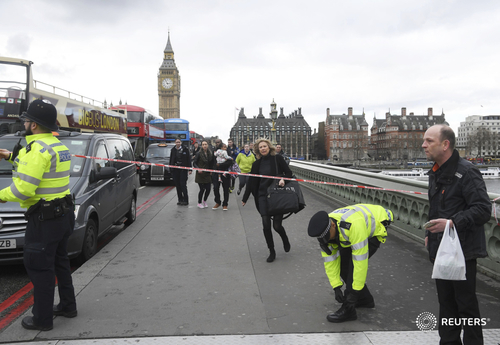 ReutersAn assailant was shot outside the British parliament by armed police, the leader of the House of Commons said on Wednesday after loud bangs were heard and a Reuters photographer saw at least a dozen injured people on a nearby bridge. First images from the scene after loud bangs were heard outside British parliament.